Aggregator is a utility app for arranging a set of files into folders based on their extension, file type, mime type, modification date or creation date. Each arranged folder is named using the common extension, type, mime type or date of the files it contains. 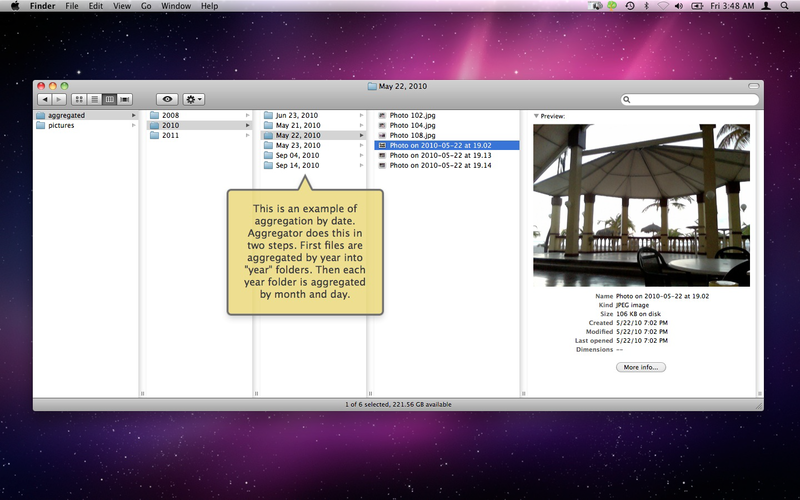 Note that Aggragator does not operate "in place" but rather creates copies of all the files processed. You are prompted for a destination folder to put the results. This functionality is available as a service or as an application. Drop a folder onto the application or status window to process the files in the folder. What can Aggregator do for me? Since aggregation copies the originals when separating them, you can filter files as follows: Aggregate the whole collection and then discard the files of types you don't want by deleting their parent folders. Aggregating files by modification or creation date puts the files into folders in daily chronological order. They are first organized by year, and then for each year, organized by month and day. It's the same as associating the files with the days in a calendar. When you aggregate files, files of particular types are placed into separate folders. You can then browse just those files with desired attributes easily using Quick Look since they all reside in the same folder. After aggregating files, using "Get Info" in the Finder, you can count files of a given type simply by looking at the number of items in the folder which contains them, and determine their cumulative size by getting the size of their containing folder. When aggregating, if a file by the same name already exists in the destination, it is re-named so that no files are overwritten. This is done by appending a UUID (universally unique identifier) to the filename.